Below is the portal to the on-line directory of several hundred radio stations worldwide offering streaming audio via the internet. Click the Country, then the Station and the audio will play immediately! Radio Australia is listed! 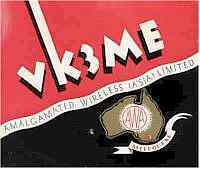 The History of Shortwave Radio in Australia by Robert J.Padula, OAM is licensed under a Creative Commons Attribution-NoDerivs 3.0 Unported License. 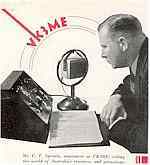 Welcome to my on-line Engineering Research Project "The History of Shortwave Broadcasting in Australia"
I am Robert V. J. Padula, OAM, (Bob) of Mont Albert, Victoria, Australia. I was one of the first Victorian War Babies of the Second World War, having been born on September 6, 1939, in Melbourne. On September 3, 1939, Britain and France declared war on Germany. Neville Chamberlain broadcast the announcement that the country was at war. This History Project is a Journey, in words, pictures. videos and sound, concerning the history, evolution, and deveopment of shortwave (high frequency) radio broadcasting in Australia. The work concerns commercial, governmental, military. and private broadcasting activity. 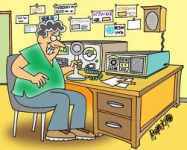 Amateur radio and "pirate" radio is not included. I have also included substantial material which looks at the inventions of land and radio telegraphy, and the progression through longwave and mediumwave telephony broadcasting technologies, in Australia and elsewhere. The Project includes articles and images from my personal visits to several shortwave broadcasting and receiving facilities in Victoria, most of which no longer exist. My hobby experiences in electronics and radio communications, which started back in the mid 1940s, ultimately paved the way for my full-time employment as a Technician, and later a Professional Engineer, in the Postmaster's General Department (now Telstra). After 41 years with the Company, I left Telstra in 1997, having reached the ranks of senior engineering management, and since then I have provided expert professional advice and consultancy in fhe field of international broadcast engineering. I am a Chartered Professional Engineer, and a Life Member of the Institution of Engineers Australia. In 1955 I undertook a Vocational Guidance program when I was in Year 10 at Camberwell High School - the assessment said that I should pursue a "Technical Career" - they were spot on! I now invite you to join me on our long journey from the middle of the 19th century to the present day! This site is optimised for Internet Explorer 9 - the use of other browsers may yield unsatisfactory results. Font size should be adjusted to suit personal viewing preferences. Google advertisements are displayed on the site - click throughs will generate a small income for the author.The content of these ads is targeted by geographical region, browsing history and site content. Please note that all images in this Project are thumbnails. Click on any image for a full-size view! Many very old images have been digitally enhanced. Unless otherwise indicated, all images are sourced to the publc domain. Click the globe to see Visitor Statistics! Please consider making a small donation via PayPal to assist wiith internet hosting charges for this Project. Please post a comment in the Guestbook! This work is divided into many Chapters, all of which are shown in the Navigation Bar at the left side of each Chapter. They are generally arranged in chronological order of the year in which the event commenced, some of which span many decades. There is a Search Engine on this Home Page - enter the desired word or phrase and you will be taken to a new window where a listing, with links, of the page(s) containing your search query will be displayed. External links about your query will also be shown. This work is in the public domain, and will be of interest to anyone interested in the history, evolution, and development of shortwave broadcasting in Australia. The Panel at the top of this page provides details about the conditions for reuse of of this work, within the Creative Commons Licencing Agreement registered by the author. The work contains over several. hundred mages, and 60 Chapters. Many images are from the author's private albums - others are out-of-copyright material drawn from public websites and print publications. In accordance with current journalistic practices, source attribution for out-of-copyright images and documents is not shown, except in special circumstances. The author's Autobiography chronicles his experiences and interests in radio communications and electrical technology, at the vocational and hobby levels, spanning the years 1939 to 2011. "Looking Back - the autobiography of Robert J. Padula - 1939 to 2011"